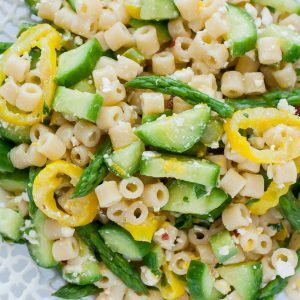 Easy enough to toss together in a hurry, this tasty Lemon Asparagus Pasta Salad is great for busy weekdays, lazy weekends, and all your summer parties and barbecues! The chickpea has a habit of marching over to the fridge and chirping for, coincidentally, the very one thing I’ve run out of. This morning it was string cheese. The horror! As to be expected this was a hard one to explain to my mini-me. She just couldn’t fathom a world where there was not string cheese awaiting her in the fridge. I know kid, I get it. A world without cheese is a scary place indeed! I’m guilty of the same disbelief. When the craving for pasta salad struck I couldn’t shake it, yet I was missing all the usual suspects! I was clear out of tomatoes and bell peppers and running dangerously low on olive oil. Of course running out of ingredients has it’s perks, and improvising has lead to my favorite P&C recipes! In fact, running out of pantry and produce staples led to [this] tasty salad, [this] wildly addictive side dish, and even my bell pepper pizzas! Talk about awesome! 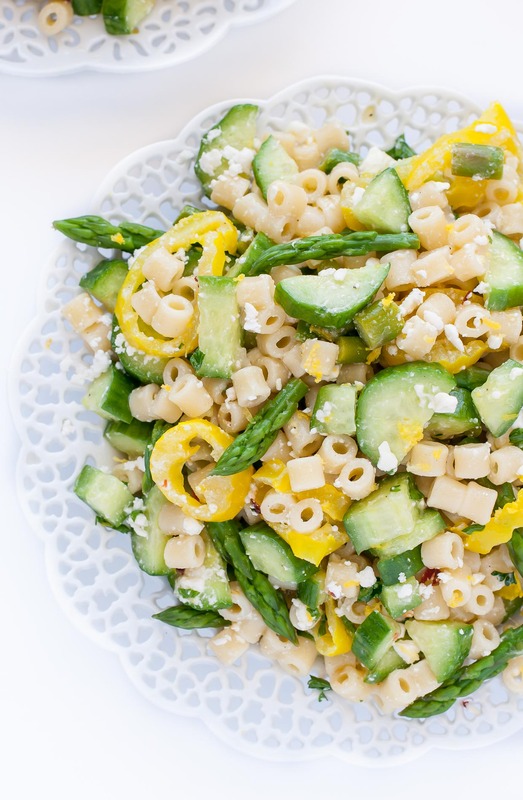 What’s even more awesome is that we now get to add this finger-licking pasta salad to the list! It’s light and crisp and so. flipping. good. Cook pasta according to package instructions, approx. 9-10 minutes for al-dente. While the pasta boils, blanch or steam your asparagus until tender yet firm, then toss in ice water to halt the cooking process. 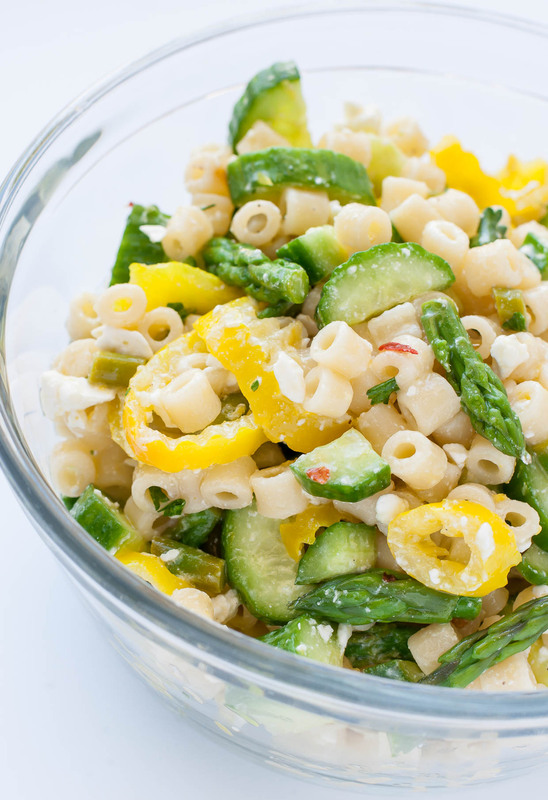 Chop asparagus, cucumber, and banana peppers if desired and add to a large bowl. In a small bowl, whisk together oil, vinegar, salt, pepper, lemon zest and juice and set aside. Remove pasta from stove top, drain, rinse with cool water, and pour into your veggie bowl. Add dressing and top with crumbled feta a sprinkling of parmesan. You can even add a pinch of parsley and red pepper flakes if you're feeling feisty! Freshly grated parmesan makes a tasty optional topping too! This salad is ready to rock your next party or picnic! Since pasta is notorious for soaking up all your yummy homemade dressing, feel free to whisk together a little extra! I like to pour a little dressing onto my salad just before serving and top it with a little bit of extra feta. So good! Nutrition Facts below are estimated using an online recipe nutrition calculator. Values will be less if serving a larger crowd. Adjust as needed and enjoy! 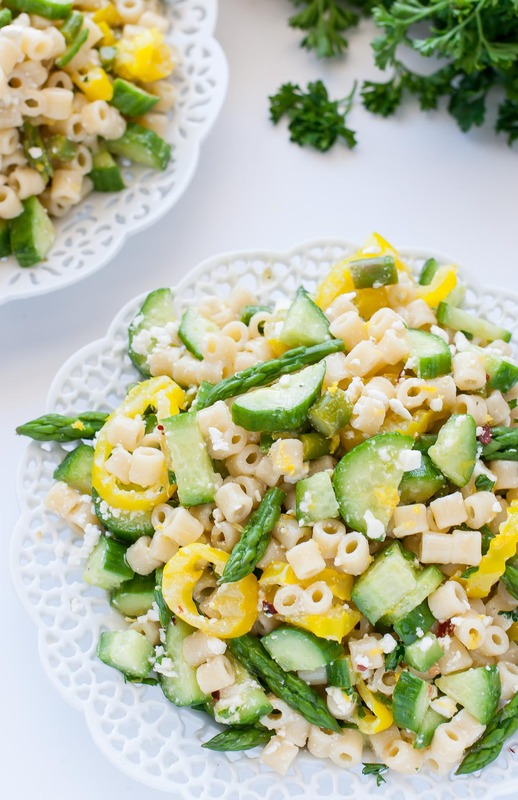 If you get a chance to try this Asparagus Pasta Salad, let me know! You can leave me a comment here (LOVE checking those daily!) or tag @PEASandCRAYONS on Instagram so I can happy dance over your creations. I can’t wait to see what you whip up! Though I used champagne vinegar, white wine vinegar and regular white vinegar will also work! Same goes for the oil, feel free to use your go-to for this salad! Avocado, olive, and grape seed are all awesome options. As for the pasta, any shape will work! Orzo would be fantastic and so would rotini. SO GOOD! 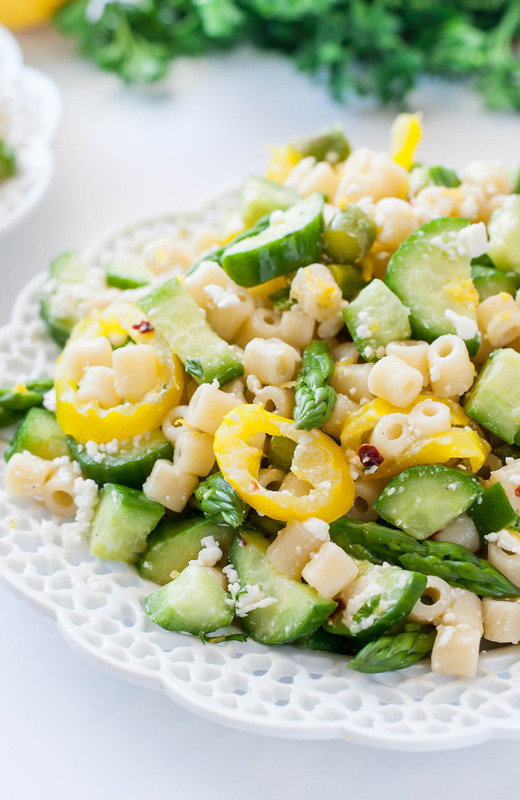 I love my classic pasta salad but this bad boy totally gives it a run for it’s money! The lemony dressing pairs perfectly with the crisp veggies, yielding a light and refreshing salad that my friends and I could not get enough of! I can’t wait to make it again! I do not have asparagus or feta but I’m thinking of substituting with thinly-sliced snow peas and gorgonzola cheese. What do you think? I’m not very good with selecting substitutes. Also, could this made a day ahead or will the cucumbers turn mushy? We left out the banana peppers and added black olives so the dish would suit our preferences. This salad was delicious! Even my daughter who swore she didn’t like sour asparagus and therefore wouldn’t like it ate thirds! Next time we’re doubling the feta though. We are cheese people to the max. Thank you so much Donna! Cheese people are my kind of people!!! I always sneak extra feta on everything too 😉 So happy y’all enjoyed it! Hi Emily! I’m so glad you love it! No error whatsoever in the whisking, but instead we’re working against science here 😉 The oil will naturally separate and need to be whisked back in for temporary emulsification. To keep the dressing together, you can add an extra ingredient such as dijon mustard and/or a little mashed feta cheese. They’ll help keep the oil and vinegar from parting ways for ya and taste great too! Looking forward to your veggie influence . I tried this but made a few changes. I just made 1 portion, and used wholewheat fusilli. I added 3 steamed asparagus stems, some cucumber and some cherry tomatoes. Then I mixed some extra virgin olive oil with some fresh lemon juice, lemon zest and black pepper. It was really tasty, and fresh. I’d definitely recommend it! Me and M have another thing in common. We chirp for cheese. I however get ignored. Another winner here- LOVE the feta and cucumber pairing! I love the addition of asparagus and am digging the lemony dressing. Sometimes the very best recipes come when we let the food in our fridge or pantry speak to us. This is beautiful. This salad looks delicious! Love the combo of flavors and textures here! Yum…..I can’t wait to give this recipe a try.